BRINGING ARTISTS AND COMMUNITY TOGETHER FOR MORE THAN 60 YEARS! 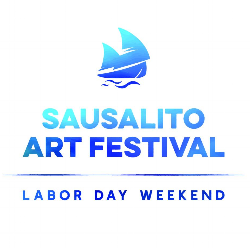 The Festival is produced by the nonprofit Sausalito Art Festival Foundation, which supports year-round activities along with the annual festival. Proceeds from the Festival support the local arts community as student scholarships, grants to non-profit arts organizations and community programs. Each year, some 1,000 community volunteers help keep the Festival running smoothly. Since before the famed California Gold Rush, Sausalito has been a magnet for artists and creative souls of all kinds due to its scenic beauty and strategic location. Weekend painters first arrived by sailboat from San Francisco in the early 1800's to capture scenes of tall ships and nature against the majestic backdrop of the Bay. The Festival has steadily grown, year after year, gaining national recognition as the #1 Outdoor Fine Art Festival in America, and earning international standing for excellence in the arts. It is now considered one of the finest and most prestigious art festivals in the United States by both artists and collectors worldwide.